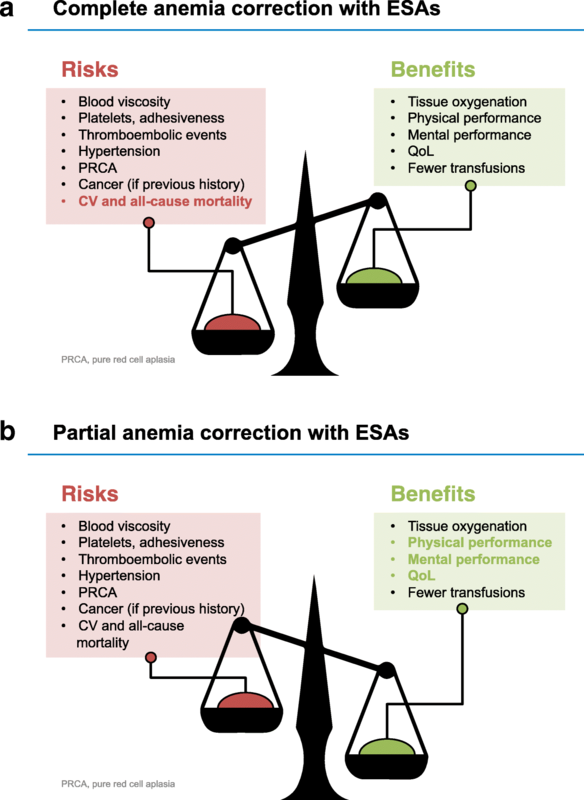 Initially, the optimal degree of anemia correction in patients with chronic kidney disease by erythropoiesis-stimulating agents (ESAs) relied mainly on the results of observational studies. Many of these studies supported full anemia correction. Subsequently, randomized controlled trials of small sample size examined intermediate outcomes, but only trials with hard outcomes could settle this issue convincingly. In contrast to expectations based on epidemiological studies, the randomized controlled trials of large sample size performed in patients with chronic kidney disease in the last two decades have convincingly shown that full anemia correction, as compared to partial anemia correction, is associated with increased risk of adverse events and mortality and that the increased risk outweighs potential benefit. Although transfusion needs decrease and quality of life increases with actively raised hemoglobin levels in severely anemic patients with chronic kidney disease, any benefit of increasing hemoglobin levels above 11.5 g/dL is at best unclear at present. As some of these patients may experience improvement in physical and mental health and overall well-being above this level, individualization of therapy may be chosen in those who are prepared to accept the associated risks. Future, adequately powered, and blinded randomized controlled trials of anemia treatment using patient-reported outcomes as primary rather than secondary endpoints are needed to answer the question of the optimal hemoglobin target as regards the quality of life. Anemia is a major complication of chronic kidney disease (CKD). This type of anemia generally develops from CKD stage 3 onwards, and its degree of severity increases with the progression of renal disease [1, 2]. It significantly contributes to patient mortality and morbidity including impaired physical and cognitive function, reduced quality of life, increased need for blood transfusions, higher frequency of hospitalizations, and an increase in cardiovascular events [3–5]. The main cause of the CKD-associated anemia is the insufficient production of erythropoietin (EPO) by the diseased kidneys, due to deranged renal oxygen sensing and subsequently reduced renal tissue mass [6, 7]. Another major contributor is abnormal iron metabolism, which is related to inflammation, oxidative stress, and hepcidin excess [8, 9], with reduced iron availability for red blood cell production. The treatment of insufficient circulating concentrations of endogenous EPO or resistance to its action by recombinant human EPO alfa in patients with CKD has been a major breakthrough in nephrology . Subsequently, many different types of erythropoiesis-stimulating agents (ESAs) have been developed and tested in the clinical arena. At present, all clinically available ESAs are EPO derivatives . In addition, two different classes of ESAs have been developed and undergone clinical evaluation. The first class is represented by peginesatide, a synthetic peptide-based ESA. It was shown to be as effective as epoetin and darbepoetin in hemodialysis-dependent and non-dialysis-dependent patients with CKD, respectively [11–13]. However, it was subsequently withdrawn from the market because of major adverse events . The second new ESA class is represented by prolyl hydroxylase domain inhibitors (PHI) which inhibit HIF-α ubiquitination and proteasomal degradation. Clinical trials with at least six different PHIs have been conducted so far in humans and have demonstrated effective anemia correction and improved iron metabolism in patients with CKD in the absence of serious side effects . The results of phase III clinical studies, which are underway at present, need to be known before the potential introduction of PHIs into clinical practice. The initial clinical use of ESAs was limited to anemia correction in patients with end-stage renal disease (ESRD) receiving dialysis therapy, mainly due to cost issues. Subsequently, ESA treatment was extended to patients with non-dialysis dependent CKD. The question then arose whether the anemia should be corrected entirely or only partially . Although the correction of severe anemia generally was associated with lower blood transfusion rates and improved quality of life, observational studies made it progressively clear that too rapid increases in hemoglobin could induce high blood pressure or aggravate preexisting hypertension and in a rare instance even lead to seizures [17, 18]. In the initial decades after the introduction of ESAs into clinical practice, numerous studies were conducted to examine the issue of the optimal benefit-harm ratio of higher versus lower degrees of anemia correction in CKD. Since the majority among these studies were observational in nature, they were unable to solve this issue definitively. Only randomized clinical trials (RCTs) can provide a convincing answer, reflecting an acceptable balance of benefits and risks. Before presenting and discussing the RCTs done in the last 30 years to address this question, let us briefly address another intriguing issue, namely whether more or less marked hemoglobin variability (also called “hemoglobin cycling”) in response to ESA treatment influences patient outcomes. Several studies were done which were aimed at limiting the degree of hemoglobin variability and hopefully improving cardiovascular morbidity and mortality. A study done in the USA found an association of hemoglobin variability and mortality in a cohort of 34,963 prevalent hemodialysis patients in 1996 . The magnitude of the association increased when restricting the analysis to hemoglobin subgroups in order to address time-dependent confounding. However, an analysis of a smaller, more recent incident cohort by same investigators failed to confirm an association between hemoglobin variability and risk of mortality . In a subsequent European study, hemoglobin variability was determined in 5037 hemodialysis patients treated by ESAs over 2 years . The authors used several different assessment methods of variability, including standard deviation, residual standard deviation, time-in-target, fluctuation across thresholds, and area under the curve. Although the authors found that patients with consistently low hemoglobin levels and those who fluctuated between the target range and < 11 g/dL had an increased risk for death, in agreement with a previous report by others , they failed to observe an independent association between hemoglobin variability and mortality risk. Thus, hemoglobin variability probably does not play a major role in patient outcomes, in contrast to initial claims to the contrary. Up to the year 2007, the results of approximately 30 prospective RCTs were reported, with a total of approximately 7000 patients included, as shown in Fig. 1 [23–26]. Initially, nearly all of them were placebo-controlled and had relatively low hematocrit or hemoglobin targets. The majority of the trials were of small sample size. Five more recently conducted trials included more than 500 patients, and only four among them had hard outcome endpoints. The first RCT with a high anemia correction target and large sample size done in chronic hemodialysis patients was reported in 1998 . 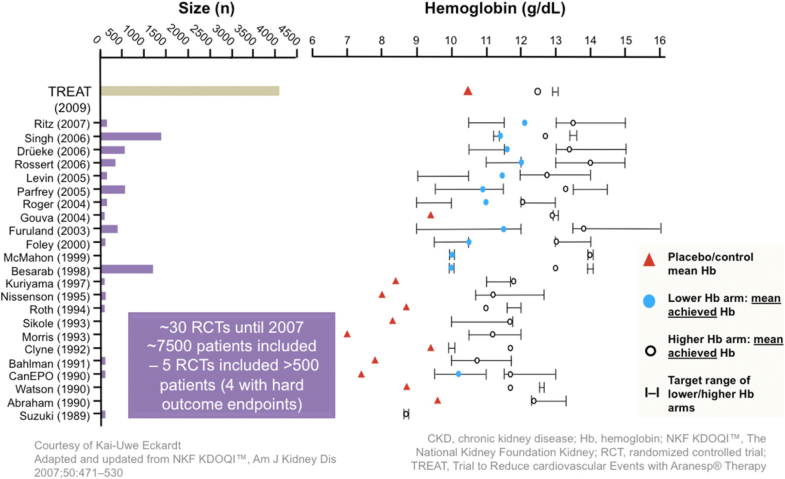 Subsequently, at least 12 additional RCTs were done testing the hypothesis that complete—or near complete—anemia correction in patients with CKD led to better intermediate outcomes (such as cardiac dimensions and function, physical activity, and decline in kidney function) than partial anemia correction, as shown in upper part of Fig. 1. None of the more recent RCTs had a placebo arm except one . It is noteworthy that in nearly all of the more recent RCTs, the achieved mean hemoglobin value was either at the lower end of or even below the predefined higher hemoglobin target and either at the higher end of or above the predefined lower hemoglobin target, respectively. This demonstrates the difficulty to obtain a prespecified degree of anemia correction despite major efforts to have investigators and patients strictly adhere to study protocol. The practical consequence is that the difference in mean hemoglobin levels between the higher and the lower hemoglobin target groups is less marked than anticipated, which in turn makes it more difficult, if not impossible, to observe statistically significant outcome differences between the lower and the higher anemia correction arm. There are probably several reasons for this, including the absence of blinding to the study targets and the participating clinicians’ unwillingness to allow the hemoglobin levels to increase or decrease more than considered acceptable. Here is a brief summary of the four partial versus full anemia correction RCTs which examined hard patient outcomes and were of sufficiently large sample size. The “Normal Hematocrit Study” involved 1,233 patients on long-term hemodialysis therapy with clinical evidence of congestive heart failure or ischemic heart disease . One group of patients was treated to achieve a target hematocrit of 30% (corresponding to a hemoglobin concentration of 10 g/dL), and the other a target hematocrit of 42% (hemoglobin concentration of 14 g/dL). The patients received epoetin alfa for 29 months, at which time the trial was prematurely stopped by the data monitoring board because there was no clear benefit of the higher hematocrit target and because of major concerns of a progressively increasing mortality risk. In the CREATE trial, 603 patients with non-dialysis-dependent CKD were randomly assigned to epoetin beta treatment to achieve a hemoglobin target of either 10.5 to 11.5 g/dL or of 13.0 to 15.0 g/dL . Follow-up time was 3 years. Full anemia correction did not reduce the risk of cardiovascular events. There was even a non-significant trend to an increased risk for death in the higher hemoglobin target group, and dialysis treatment was required in more patients of this group. On the positive side, there was evidence for a quality-of-life benefit. The CHOIR trial involved 1,432 patients with non-dialysis-dependent CKD. They were treated with epoetin alfa to achieve a hemoglobin target of either 11.3 g/dL or 13.5 g/dL . Median study duration was 16 months. Patients in the higher hemoglobin target group were found to have a higher risk for cardiovascular events and death than those in the lower target group. The adverse outcome was associated with increased risk for congestive heart failure and hospital admissions. There was no between-group difference in quality-of-life scores. TREAT included 4,038 patients with type 2 diabetes mellitus and non-dialysis-dependent CKD . Participants either received darbepoetin alfa to achieve a hemoglobin target of 13 g/dL (achieved median hemoglobin 12.5 g/dL) or placebo, with rescue darbepoetin treatment when hemoglobin was less than 9.0 g/dL (eventually achieved median hemoglobin 11.1 g/dL). After a mean follow-up of 29.1 months, there was no substantial benefit in the group treated to the high hemoglobin target. Of major concern was the observation of an increased risk for stroke in the high hemoglobin group. Blood transfusions were needed more frequently in the placebo-treated patients. There was only a modest improvement in patient-reported fatigue in the darbepoetin alfa group as compared with the placebo group. What have we learnt from the clinical trials with ESAs? In accord with the 2012 KDIGO anemia guideline , one can summarize the main lessons from the RCTs of anemia correction by ESAs in patients with CKD as follows. The most important lesson of the recent RCTs with hard outcomes is that in patients with CKD, full anemia correction, as compared to partial anemia correction, is associated with increased risk of adverse events and mortality and that the increased risk outweighs the potential benefit. Figure 2 shows the progressive increase in risk and decrease in benefit with actively raised anemia correction values. Higher hemoglobin correction targets are associated with less transfusion needs than lower hemoglobin correction targets, but the optimal hemoglobin value at which both transfusion needs and cardiovascular and other risks are reasonably low is not known. Moreover, this value probably varies from one patient to the other. The results of the recent RCTs, with a particularly strong impact of TREAT, led the workgroup of the 2012 KDIGO anemia guideline to recommend major changes in the approach of anemia treatment . Since often high to very high doses of ESAs are needed to raise hemoglobin levels towards the normal range and iron deficiency is known to induce ESA hyporesponsiveness, the KDIGO workgroup advised to first refill iron bone marrow stores by the oral route in CKD stage 3–5 patients and by the intravenous (IV) route in in CKD stage 5D patients. Since oral iron compounds are generally ineffective in these patients and not well tolerated by them, with the exception of the subsequently introduced oral iron phosphate binder ferric citrate [27–29], this recommendation led to a marked increase in IV iron supplementation in the USA in the years following the release of the 2012 KDIGO guideline . The change in the approach of anemia treatment was greatly enhanced by financial incentives driving caregivers to administer “cheaper” IV iron in an attempt to decrease the use of “expensive” ESAs . Of note, achieved serum ferritin levels in chronic hemodialysis patients vary widely by geographic region, as shown by an international Dialysis Outcomes and Practice Patterns Study (DOPPS) reported in 2018, with median serum ferritin levels of 718 ng/mL in the USA, 405 ng/mL in Europe, and only 83 ng/mL in Japan . In this prospective cohort study, high ferritin levels (relative to region-specific medians) were associated with elevated mortality in all three regions. The irony is that there are no hard evidence-based RCTs to support recurrent high dose IV iron administration, with its potential for long-term risks of iron overload and adverse patient outcomes [31, 33]. Thus, at present, we still ignore which amount of iron supplementation is too much in patients with CKD . Hopefully, the PIVOTAL study will bring a convincing answer to this issue . PIVOTAL is a multicenter RCT conducted in more than 2800 chronic hemodialysis patients in the UK. It compares proactive high-dose and reactive low-dose IV iron regimens with respect to all-cause mortality and incidence of non-fatal CV endpoints as well as ESA dose requirements, the need for transfusions, the incidence of infections and other complications of hemodialysis and indicators of quality of life. The trial has been terminated recently (Iain Macdougall, personal communication). Its results should be known by the end of the year 2018. The KDIGO anemia guideline of 2012 suggested a drastic lowering of target hemoglobin levels, more cautious initiation of ESA treatment, and lower maintenance ESA doses as compared to prevailing practice in Western countries at that time. This suggestion was not only influenced by the observation of increased risk of cardiovascular and cerebrovascular events and mortality with anemia correction to high hemoglobin targets, but also by the observation of a higher incidence of vascular access loss and of higher mortality risk in patients with a history of cancer. It is interesting to note that patients who achieved higher hemoglobin levels in these RCTs had better outcomes than those with lower hemoglobin levels. Thus, not higher hemoglobin concentrations but higher ESA doses correlated most strongly with adverse outcomes. This would suggest that high ESA doses might have detrimental off-target effects . However, high doses are needed to overcome ESA hyporesponsiveness and this is linked to many different mechanisms, including iron deficiency and inflammation, which may be the real culprits [36, 37]. From the patients’ point of view, one of the most important issues is the relation between the degree of anemia correction and improved quality of life. In 2010, the authors of a meta-analysis of 27 trials concluded that the evidence for effects on quality of life was limited by selective reporting and that trials reported insufficient information to allow analysis of the independent effects of ESA dose on clinical outcomes . However, it is well known that the majority of severely anemic patients with CKD experience substantial physical and mental health benefit in response to a rise in hemoglobin level. The question above then is which degree of anemia correction should be used to further quality of life benefit. To answer this question, the participants of an NKF and FDA sponsored symposium in the USA proposed to design adequately powered, blinded randomized controlled trials of anemia treatment using patient-reported outcomes as primary rather than secondary endpoints . RCTs in which the difference between higher and lower achieved hemoglobin levels are small probably cannot provide a correct answer, especially in settings where the baseline hemoglobin is around 10 g/dL. The mean difference of achieved hemoglobin levels between the patient groups allocated to higher and lower anemia correction targets was 1.3 g/dL in CHOIR, 1.4 g/dL in TREAT, 1.9 g/dL in CREATE, and approximately 4 g/dL in the “Normal Hematocrit Study”, respectively [23–26]. In the latter trial, the physical function score on the quality of life questionnaire at 12 months showed a clinically meaningful increase of 7.2 points, with no significant changes in the scores on the other seven scales. However, this study was done in relatively disabled chronic hemodialysis patients with congestive heart failure or ischemic heart disease. Among the subsequent three RCTs done in non-dialysis-dependent CKD patients with less comorbidities, only CREATE found significant quality-of-life benefit, in response to an achieved mean hemoglobin increase of 1.9 g/dL. Patients randomly assigned to the higher hemoglobin target experienced improved general health and physical function scores. In contrast, TREAT and CHOIR with lower achieved mean hemoglobin level differences found either no  or only one  improvement among several quality-of-life scores tested. Another issue is that the response to ESAs varies considerably from one CKD patient to the other and that the subjective perception of improvement probably fades away after prolonged time periods. Therefore, KDIGO anemia guideline says that individualization of therapy is reasonable and ESA therapy may be started in selected patients above a hemoglobin value of 10.0 g/dL as some of them may have improvements in quality of life at higher hemoglobin concentration . Moreover, it admits that individualization of therapy is necessary as some patients may have improvements in quality of life at hemoglobin concentration above 11.5 g/dL and will be prepared to accept the risks. The main lesson learnt from randomized controlled trials in patients with CKD is that on the average full anemia correction, as compared to partial anemia correction, is associated with increased risk of adverse events and mortality and that the increased risk outweighs the potential benefit. There is no question that raising hemoglobin levels in severely anemic CKD patients is extremely beneficial for physical and mental health and overall well-being. It remains unclear at present which patients may experience improved quality of life when hemoglobin is actively increased above 11.5 g/dL. Individualized therapy is probably the answer, weighing the potential benefit against potential harm (Fig. 3). TD gratefully acknowledges support from the Japanese Society for Dialysis Therapy. The manuscript has been written by me alone. The author read and approved the final manuscript. TD reports personal fees from Amgen, FMC, Genentech-Roche, Kyowa Hakko Kirin, Sanofi, and Vifor.